VanLandschoots work as a team—from net to sale. Grandfathers, fathers, sons, uncles, brothers and cousins have all played a role VanLandschoot & Sons Fishery for more than 100 years. Whether fishing under the ice in Bay de Noc on Lake Michigan as they used to, or out of the three Lake Superior ports they now use. 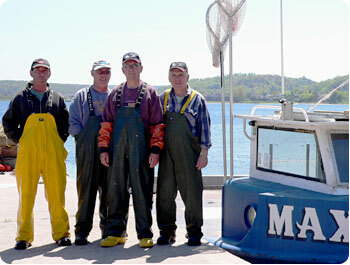 The current generation—brothers Jerry, David and Gary and their cousin Paul—are proud of their heritage and have been involved in fishing, one way or another, since they were pre-schoolers. Each team member knows what he needs to do, and all move through their tasks with precision that reflects their years of experience. 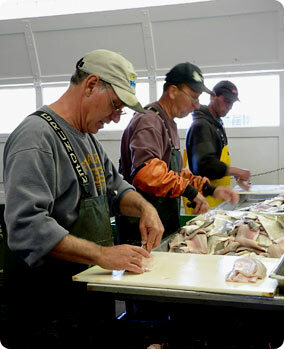 They fillet the whitefish with their razor sharp knives faster than the eye can follow. This is their life’s work, and they do it well, taking great care to market only top quality fish. Their Belgian grandfather Phil, who started this family’s business, would be proud. 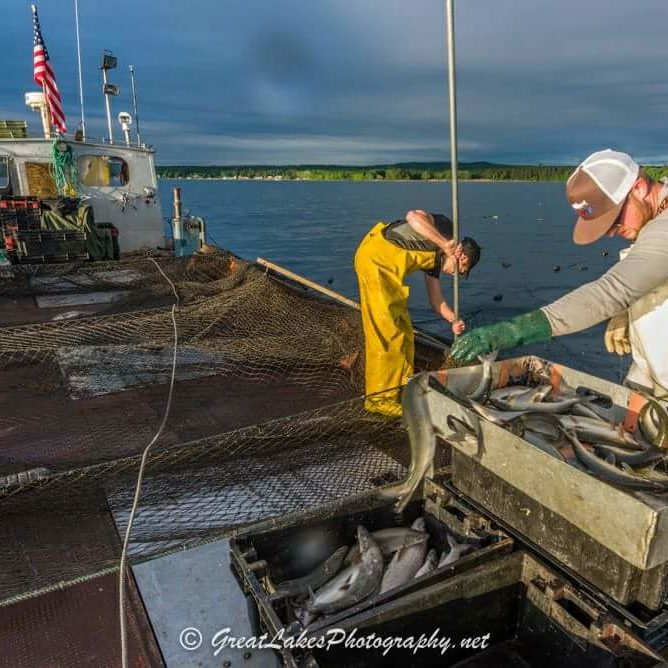 The VanLandschoots set trap nets off the Keweenaw Peninsula, as well as closer to their home port Munising, so they’re constantly on the go during fishing season. On the 360 mile round trips to Keweenaw Bay, they start at 3 a.m. and try to be back to Munising with the iced day’s catch before night fall. They hope to haul in enough prized Lake Superior whitefish to cover their fuel and other costs. The boats get only a mile per gallon and.those costs have been rising faster than the price they get for their fish. It’s a close call sometimes, but when fishing is good, the weather is fair, and the price of fish is reasonable….it’s hard to beat. The VanLandschoots’ hard and sometimes hazardous work pays off with benefits not measured in money. Paul says his physician recommends the fresh air and physical exercise for his health, perhaps a bit enviously because the doctor’s work keeps him in an office or the hospital. They plan to keep the business going as long as they can. One question they, and many fishing families, face is whether the business will go into another generation. It’s hard to say because, like so many others in commercial fishing, they’ve encouraged their children to develop interests and pursue education that have taken them away from their home port…for now. The business succession plan is always a work in progress.